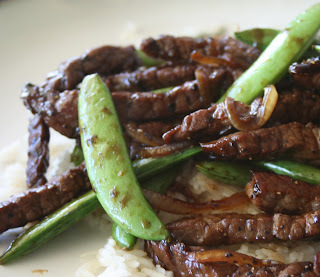 It really IS that easy to make...: Recipe #32: Honey and Black Pepper Beef- WOK RECIPE! Recipe #32: Honey and Black Pepper Beef- WOK RECIPE! I christened my wok, and it was a success! I was quite thrilled to try my hand at using a wok for the first time after so much anticipation. Even Nick tossed the ingredients around a little bit. From my stir-fry cook book comes a great and simple recipe for honey and black pepper beef. 2. Reheat the wok, add 1 tablespoon of the oil and stir-fry the garlic, onion, and sugar snap peas until softened. Remove from wok and set aside. 3. Add the honey, soy sauce, oyster sauce, and cracked pepper to the wok. Bring to a boil, then reduce the heat and simmer for 3-4 minutes, or until the sauce thickens slightly. 4. Increase the heat, return the meat and vegetables to the wok, and toss for 2-3 minutes, or until well combined and heated through. This look very tasty Heather!